Since my work in 2014 and 2015 on a series published by Slate — a project supported by a yearlong Soros Justice Media Fellowship — I have focused most of my reporting on examples and issues that will help me expand the original project into a book. That work can be found on the Articles page. What ties all of this work together? One big question: What would it look like to have a truly victim-centered system of justice — one that does not treat the punishment of offenders, and the offering of token gestures of sympathy, as the full extent of our obligation to our fellow citizens? That leads to other questions. How did the original victims’ movement get hijacked by tough-on-crime advocates? What gaps does that leave in the help needed by the most grievously injured and traumatized victims? And what shape would law enforcement and justice take if their chief goal were to spare more people from becoming victims in the first place? The answers would go a long way toward solving our most vexing problems in public safety: the still unacceptably high rate of violence in many of our cities and the broken relations between those same communities and the police sworn to protect them. My work on that idea, and on articles that expand on what I already have seen and written, continues. Four years after his father died a hero's death fighting a fire, Tim Ginocchetti was behind bars for killing his mother. How one tragedy led to another is a true story that puts a horrifying twist on the familiar one of bullied gay teens. In this case, the bully was the teen's own mother, and instead of harming himself he killed her in a momentary but irreversible explosion of rage. God’s Nobodies exposes the destruction of a meek young man whose only refuge was a childlike fantasy world of his own imagination. His family's blind obedience to their minister compounded the losses, first by turning Pam Ginocchetti against her son, and then by turning the rest of Tim's family against his loving grandmother — the one person brave enough to take a stand for forgiveness and truth after Pam's death. 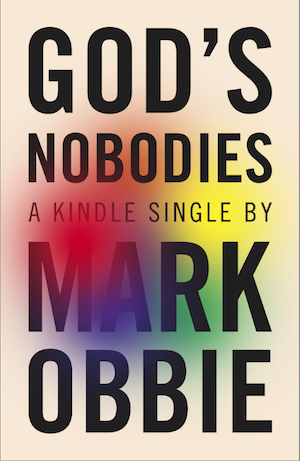 God’s Nobodies – the title comes from a biblical story twisted beyond recognition by the family’s minister, a central character in the story – spent 10 weeks on Amazon’s top-10 nonfiction list of Kindle Singles. It is also available from Audible.com. This e-single (shorter than a typical book, longer than a typical magazine article) is available only in digital form but a Kindle device is not required. At this link, you’ll find free Kindle reading apps for computers and phones.